Well after travelling in remote Andes, my own bath was a highlight. Having wifi and TV were nice. Place clean, they catered to my disabilities. Staff extremely friendly and helpful. Asked about a box and packing tape as suitcase getting overweight. Since use a cane they had a boy did the running around for me. Given excellent directions to post office and night market. This was a day of rest after 6 days in road tour and a new tour on the road the next day. I rebooked for two nights after my tour. Where to find Colinas del Urubo hotels near an airport? 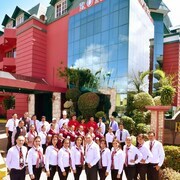 Where can I find hotels in Colinas del Urubo that are near tourist attractions? If you are taking a vacation in Tropical Lowlands and you're looking for Colinas del Urubo hotels, Expedia offers a wonderful range to select from. Spend some time looking through our 47 accommodation listings, which are all within a 0.1-kilometre (0.06-mile) radius of Colinas del Urubo's city center. 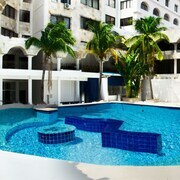 There are not many hotels to choose from within easy walking distance from the center of Colinas del Urubo. The Guembe Biocentro & Resort is an ideal choice as it's only 3 kilometres (2 miles) away. 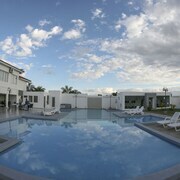 4 kilometres (2 miles) away from the center of Colinas del Urubo, is the Buganvillas Hotel Suites & Spa. Alternatively, the Yotau All Suites Hotel is positioned 5 kilometres (3 miles) away. 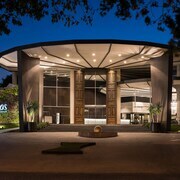 If you'd prefer, you could investigate the Camino Real Hotel or the Senses Boutique Hotel. Looking to go a bit further afield? Tropical Lowlands has a number of things to see. Tropical Lowlands is marked by forests, rainforest and rivers. Popular Tropical Lowlands tourist sites include ruins. Visitors in this part of Bolivia often enjoy guided nature walks. The Cine Center is a well-known place of interest in the area. 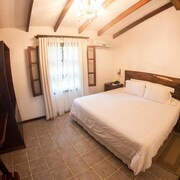 Find accommodation in Santa Cruz, which is 6 kilometres (4 miles) to the southeast of downtown Colinas del Urubo. 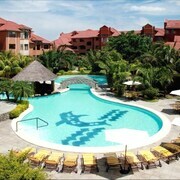 The Suites Apart Hotel Ortiz and Urbari Apartment Resort Hotel are among the choices. Just because you are far from home, doesn't mean you can't enjoy your obsession for all things sport. Ramon Tahuichi Aguilera Stadium is situated 7 kilometres (4 miles) to the southeast of Colinas del Urubo. Those wishing to stay near to the sporting action can take their choice from the Villa Magna Apart Hotel or the Hotel Arenal. Situated 15 kilometres (10 miles) away from Colinas del Urubo is Viru Viru International Airport. 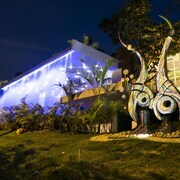 Stay nearby at Casa por Temporadas or Sun Hotel. What are the most popular Colinas del Urubo hotels? 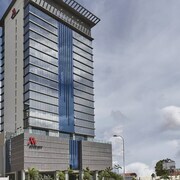 Are there hotels in other cities near Colinas del Urubo? What other types of accommodations are available in Colinas del Urubo? Explore Colinas del Urubo with Expedia.ca’s Travel Guides to find the best flights, cars, holiday packages and more!